The Clemson wide receiver not named Sammie Watkins had a very productive junior season with 42 catches for 828 yards and seven receiving touchdowns. After you have adjusted your eyes to his 6′ 5″ 201 lbs. size, it is clear that the wide out enjoys run blocking as he steps up and gets in the defender’s face right away. You might be asking yourself, why does that matter? A big physical receiver that likes to block will see a lot of playing time versus a tall specialist who only gets work in three or four wide sets. After watching his games against Ohio State and Syracuse, it seems to me that Bryant could grow into an NFL WR2 role perhaps like a Tampa Bay Mike Williams. He has an explosive first step, and catches the ball in stride. The wide out can contort his body to adjust to poorly thrown passes, but unfortunately has the tendency to body catch. Bryant fights off physical coverage, has great concentration, and knows where he is on the field at all times as he uses the sidelines to his advantage. 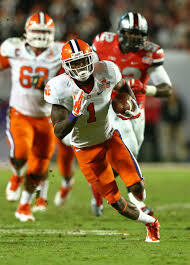 In the bowl game against Ohio State, the receiver had two amazing touchdown receptions. On the first one, Bryant beat the corner to the back of the end zone with inside position and out jumped the defender to come down with the ball. The more spectacular catch was when Bryant tipped the ball back into his hands with the defender draped all over him while falling down after getting both feet down to score the touchdown. The wide out has enough speed to get behind defenses and take it to the house if you try to not use safety help with him. Bryant has a lot of room to grow with frame, so he could become a powerful receiver under the right training program after gaining 10-20 pounds. I would draft him in the late third to early fourth rounds with his current upside. Jeffcoat is not the ideal size for a defensive end at 6′ 5″ 245 lbs. He is too tall to be a typical outside linebacker and too lite to be a defensive end in most schemes. The defender played up and down the line as a Longhorn: defensive end, inside linebacker, and outside linebacker. He would rush standing up at the one gap, two gap, as well as the six and seven gaps. Jeffcoat has a great first initial step, as he gets pressure on the quarterback right away. He uses either a quick swim move or tries to bull rush his way there. The tweener does a good job keeping the linemen off his body when he is pass rushing with his long arms, but struggles to keep those same offensive linemen off his body when they are run blocking him. Jeffcoat is not a fluid athlete as he looks awkward and off balanced flowing to the ball on running plays. As a defensive end, he does not seal the edge in the running game which makes his position hard to figure in the NFL. He reminds me a bit of Seattle’s Bruce Irvin who found a place as a pass rushing specialist. Depending on how he gets used, Jeffcoat could be a great guy to have especially in a sack heavy scoring league. This isn’t the most exciting of rookies to discuss as he is one of the rare two-way tight ends. Jensen is a decent blocker who wasn’t featured much in the Derek Carr led Fresno State offense as he finished with only 26 receptions, 353 yards, and three touchdowns. He got hurt day one of the Senior Bowl so he did not get to impress the NFL teams down in Mobile or give us in attendance much to see. From the tape, Jensen is explosive off the line and can catch the ball in stride most often on post routes. He did not run many different types of routes, but the tight end did a nice job of catching the ball with his hands. Jensen did a good job of getting to the ball in traffic and getting to the pigskin at its highest point. This tight end might be a better fullback/wing back type of player than an inline blocker. Don’t forget about Jensen in premium tight end leagues as he could develop into a Dennis Pitta type of player in a season or two. If you enjoy what you just read, please support the writer by using the big donate button at the bottom of the front page. Thanks!